The Mediterranean, Black, Baltic and Caspian Seas are characterised by a common feature of being geographically enclosed or semi-enclosed basins, subject to intense anthropogenic pressures while providing important resources on which major economic activities of international, regional and national importance rely. The regional seas connect the riparian countries and are also part subject to the countries within the national maritime zones. These seas have fragile coastal and marine ecosystems, with the activities and maritime policies of states affecting the quality of the marine environment of other regional states within the same basin. These regional seas exhibit different levels of experience in regional cooperation, sustainable development of the resources and services of the ocean, and this diversity and wealth of experience provides an opportunity for comparative learning. This training programme is a flagship activity of IOI together with that delivered from the University of Dalhousie in Canada and builds upon the more than 35 years' experience of the International Ocean Institute in conducting training and capacity building programmes on ocean governance. One of the main objectives is to assist in the formation of a core of decision-makers who will be aware of the complex global and regional contemporary issues of coastal and ocean management. The Ocean Governance content covers contemporary approaches to coastal and ocean management, with an emphasis on moral, ethical and legal values in Ocean Governance (equity and peaceful uses of the ocean) under the governance architecture of UNCLOS and related international; instruments and agreements. As from 2017, participants successfully completing all course material will be eligible to receive transcripts from the University of Malta equivalent to 15 ECTS, or 5 ECTS per Study Unit achieved. This year’s course content shall be delivered in the form of 3 stand-alone Study-Units (GSC 5101, GSC 5102 and GSC 5103), which together make up the full Training Programme on Regional Ocean Governance for the Mediterranean, Black, Baltic & Caspian Seas. For more information regarding Training Programmes kindly click on http://ioimaltacourse.org. 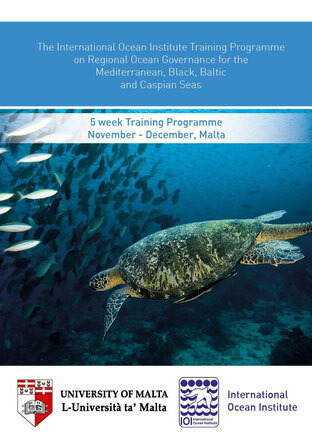 The five-week Training Programme on Regional Ocean Governance for the Mediterranean, Black, Baltic and Caspian Seas is being offered for the 14th consecutive year and is currently being held in Malta from the 5th November to the 7th December 2018. The Training Programme was launched in the presence of the Minister for the Environment, Climate Change and Sustainable Development Hon José Herrera, officials from the University of Malta and IOI. The ceremony was attended by University Pro-Rector Prof Godfrey Baldacchino, German Ambassador to Malta HE Walter Haßmann, representatives from the Ministry for Foreign Affairs and Trade Promotion, and the course participants. This year’s course alumni total 18, hailing from Algeria, Tunisia, Egypt, Morocco, Cyprus, Spain, Georgia, Turkmenistan, Lithuania, Russia, China and Malta. As in previous years, the 2018 Malta Training Programme gave the participants the unique opportunity to obtain formal accreditation by the University of Malta for the academic content of the Course by completing and submitting the full Study Unit assessments. Successful achievement of the accredited Study Units was equivalent to 15 ECTS from the University of Malta, host institute of the IOI Malta Training Centre. This year’s 18 participants hailed from 12 countries surrounding the regional seas: Morocco, Algeria, Tunisia, Egypt, Sweden, Lithuania, Russia, Georgia, Cyprus, Turkmenistan, Malta; and PR China. As in previous years, the participants came from diverse academic and professional backgrounds, ranging from coastal and marine management to engineering, hydrology and aquaculture management. A Special Seminar was also held during the training programme on the 3rd December entitled 'Marine Genetic Resources (MGRs): Access and Benefit-Sharing' organised by the IOI with support and collaboration of the European Commission Representation in Malta. The five-week Training Programme on Regional Ocean Governance for the Mediterranean, Black, Baltic and Caspian Seas will be offered for the 15th consecutive year from the 4th November to the 6th December 2019 (subject to confirmation).